The Courtpages Windows Management software has been offered since 1998 as a complete court reporting software package and Internet service for court reporting companies. 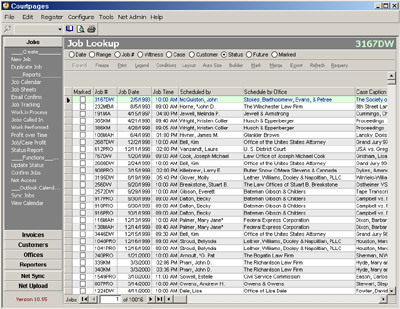 Using the Courtpages Windows software you can schedule depositions and proceedings, create invoices, manage reporter payroll (3 different payroll methods), and create many reports customized for the court reporting business. The Courtpages Windows Software is a replacement to any other software package that you currently use to manage your company. By using our management software you also are have access to a complete interactive Internet site for your customers and reporters which includes a transcript, exhibit and invoice repository as well as a reporter online area for viewing schedule and payroll information 24 hours a day 7 days a week. Each web page has your own company header, logo, and likeness so that customers never feel like they have left your web site. All activity by a customer is recorded for you to view later. This includes when a customer logs on the Internet repository, fails to logon, downloads a transcript, orders a product, or schedules a proceeding. This way you can track exactly what is happening on your web area at all times. Try a complete demonstration of a company that uses the Courtpages Internet Service by going to www.textnet.com. Logon using the username: Mason and password: 3333. All of the above information is available on the Internet and at any time for your reporters to use. Your company may optionally password protect the future calendar and unassigned future calendar reports in case you do not want all reporters viewing them. By having a Internet site your reporters can check the calendar, check assignments, follow their work in progress, and inquire on any payroll reports whenever they want and from wherever they want. Phone calls can be reduced and communication can still remain clear as reporters switch to using the Internet to follow what is happening on a day to day basis in the company. Courtpages offers a secure and legally binding digital signature service to all customers of our internet repository service. Our digital signature service is a replacement to RealLegal digital signatures or any other digital signature service used to electronically sign and authenticate documents and transcripts. The Courtpages digital signature system integrates directly with our Internet document repository to allow anyone to easy sign any document that is uploaded to our online repository. Each document uploaded may be signed on behalf of a reporter who certifies the paper/electronic document. When an attorney or counsel member attempts to download a signed document, it is first verified for authenticity using the digital signature on file. This guarantees each electronic signature and acts as a guarantee that the document has not been altered since the original was uploaded to the online repository days, months, or even years prior.